Hi it has been a while since my last review of 76105 The Hulkbuster: Ultron Edition on 24 January. Endgame will be showing in the cinema this 24th April and I'm very excited for the movie! Let's put on the Quantum Realm suit and go time travel! The Polybag I got this one as a gift from @makoy and it's my precious now. Thank you so much my friend. The bag looks pretty clean with white background like those Quantum suits and the front art features Iron Man Mark 85 and the content of the bag. Here is the two paged instruction of a small build of Iron Man in Quantum suit and Dum-E. As you can see, there's still room for advertisement of other Avengers Endgame LEGO sets at the top right corner of the first page. The Minifigure. Here is the main character of the set featuring Iron Man in Quantum suit. This is the exact same Quantum suit (torso and legs) of the other sets so it is not so 'exclusive' to the set as you can take the helmet and mark 50's Tony Stark head to put on other Quantum suit. Tony's head is also the exact same Mark 50's head. But this will be exclusive when you need to take a group photo of all of them wearing the same suit with different heads. About the suit, despite being so common in this series, it is actually a very clean and nice looking suit with the matt finish of the center part of the torso, Avengers logo and a pinch of reds sprinkled on the torso and legs. Good thing is the legs are also printed makes it look cooler. The Build Dum-E. This is a simple build of Dum-E that assists Tony in his lab. The design of this build is simple yet wonderful. The base is actually resembling its wheels with the use of two black 1x1 round plate. The connector between the arm and the base is kind of 'decorated' by some yellow bricks and connected with the blue technic pin in the middle. The mechanical arm of this build is actually one hinged arm and can only be moved upward and downward. However as it goes nearer to the flame, the articulation improves by the use of this Light Bluish Gray Bar 1L with 1 x 1 Round Plate with Hollow Stud which makes 360 degree rotation of the flame possible. The Light Bluish Gray Bar 1L with Top Stud and 2 Side Studs which connects the flame part also helped in articulation of the mechanical arm. The 'play' feature of this polybag is kind of making Iron Man fly with the help of the Trans-Clear Bar 12L with 1 x 2 Plate End Hollow Studs and 1 x 1 Round Plate End and the Trans-Clear Dish 4 x 4 Inverted (Radar) with Open Stud which is labeled NEW part in Bricklink. I really loved the dish and bar here which can be used to make lots of other things fly and helped a lot in LEGO flight photography! Conclusion This set features the new design of Dum-E which can be easily MOC out and the 'exclusive' Iron Man minifigure. To me it is quite special that the Iron Man here uses the round trans blue tile instead of plate which is quite surprising yet interesting. Other than that it is a quite simple polybag to me. Review SummaryPlayability: 6/10 - Very simple posing features of Dum-E and flying Iron Man.Design / Building Experience: 6/10 - Very simple build.Minifigures: 8/10 - The Quantum suit is actually very nicely designed and printed.Price / Value for money: 8/10 - It is a free promotional item. But it is a priceless gift for me by a very good friend.Overall: 8/10 - A crucial polybag to be collected if you really need a complete Quantum suit Avengers. It can still be replaced by putting iron man head on the other Quantum torso and legs. After some research in bricklink, the NEW Dish 4 x 4 Inverted (Radar) with Open Stud is actually exclusive to this polybag! So it's a worthy polybag after all. Hope you enjoy the review, do share your thoughts in the comments! The emerging of custom and bootlegs minifigures made a lot of us confused in which ironman is actually official LEGO Iron Man. So let's compile this up. There was an idea. To make all LEGO Iron Man to fight Thanos in Infinity War. There are total 18 figures here including hulk buster and the nanofig. 76007: Iron Man: Malibu Mansion Attack 76006: Iron Man: Extremis Sea Port Battle 76031: The Hulk Buster Smash 76032: The Avengers Quinjet City Chase 76038: Attack on Avengers Tower 76029: Iron Man vs. Ultron 76051: Super Hero Airport Battle They appeared in these sets. 6867-1: Loki's Cosmic Cube Escape 30167-1: Iron Man vs. Fighting Drone 6869-1: Quinjet Aerial Battle 10721-1: Iron Man vs. Loki 76008-1: Iron Man vs. The Mandarin: Ultimate Showdown 76083-1: Beware the Vulture According to bricklink, the torso and legs are the same. Even the head inside also have the same code number. So I assume they are the same iron man. Thanks Bo-Ching Su for asking! There is a very nice comparison by Jay's Brick Blog about these two minifigures and they are more or less the same. 76042-1: The SHIELD Helicarrier 76072-1: Mighty Micros: Iron Man vs. Thanos 76077-1: Iron Man: Detroit Steel Strikes sh027: Iron Man (Toy Fair 2012 Exclusive) 76048-1: Iron Skull Sub Attack 76049-1: Avenjet Space Mission 5002946-1: Silver Centurion *Added on 3rd April 2019 5005256 2018 Bricktober Marvel Infinity War Minifigures 30452 Iron Man and Dum-E 76107 Thanos: Ultimate Battle 76108 Sanctum Sanctorum Showdown 76131 Avengers Compound Battle Added 76125 Iron Man Hall of Amour for Mark 50. Thank you @Feng-huang0296 from Eurobricks. 76105 The Hulkbuster Ultron Edition Thanks @q_159 from Eurobricks for reminding me of this one that I missed. *Added on 3rd April 2019 *Edited Mark III to Mark V. Thank you @Feng-huang0296 from Eurobricks. 76125 Iron Man Hall of Amour 76031: The Hulk Buster Smash *Added on 3rd April 2019 76104 The Hulkbuster Smash-Up 76105 The Hulkbuster Ultron Edition 76124 War Machine Buster 41590 Iron Man Brickheadz. Thanks @Edwinder Singh for pointing this out! *Added on 3rd April 2019 41604 Iron Man MK50 41492 Iron Man & Captain America - San Diego Comic-Con 2016 Exclusive Thanks to Zheng Hong Xi in facebook for pointing out the 41492 Iron Man. 4259: Iron Man Thanks @林子崴 for adding this! 76006 Iron Man: Extremis Sea Port Battle 76051 Super Hero Airport Battle 30168 Gun Mounting System polybag 76038 Attack on Avengers Tower Thanks @Unknown for notifying these War Machines! 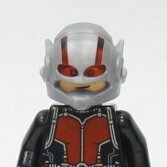 *Added on 3rd April 2019 5005256 2018Bricktober Marvel Infinity War Minifigures 76124 War Machine Buster To me, my favorite ones are Heartbreaker, Mark 45 and Silver Centurion. Now that you got this information, go get them! Do leave a comment if I left out anything. Thanks for reading! Do like and share our page and follow us for more LEGO! Goldbricks Images taken from Brickset and Google. Batman LEGO Compilation.